26/10/12 - Acquisition - Compiègne, château - Over two years ago, we had talked about a fundraiser launched by the château de Compiègne for the purchase of a national treasure : a tapestry cartoon by Charles Natoire representing The Duchess’ Maidservants Remove Don Quixote’s Arms (ill.) which was to be acquired for the price of 300,000€ (see news item of 12/5/10). Fortunately, this work has now joined the château collections after being purchased from Etienne Bréton in Paris thanks to funding from the Ponthieu Rabelais company, headed by its president Eric de Rothschild. It will undergo restoration at the C2RLF until March 2013 (lightening of the very yellow varnish, removal of pentimenti and a small procedure on the support). The painting will not be presented in the room already housing the other cartoons due to lack of space (unless a window is closed which is not feasible) but will hang rather in a gallery now exhibiting portraits of the king and his family where there is a panel with the corresponding size. The portraits will be moved to an adjacent room in order to make place for Natoire. 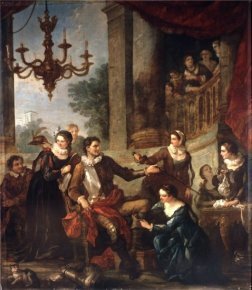 Two canvases in the series still remain to be found : Sancho Leading the False Dulcinea to his Master and The Meeting between Don Quixote and the Duchess.